Ah, San Francisco—never Frisco, as residents will tell you. Just San Francisco or the City. It’s perhaps one of America’s most charming, European-feeling cities. With its gorgeous Victorian homes (the Painted Ladies), relaxed and quirky sidewalk cafés, luxe shopping, and fine food and wine, it’s no wonder this jewel on the bay is a postcard-perfect destination. I have to admit I’m partial to San Francisco, since I lived there for four wonderful years after college in the ’80s. When Tony Bennett sang “I Left My Heart in San Francisco,” I knew why. The people are the friendliest, the surrounding natural landscape (Marin County’s Stinson Beach, the giant redwood trees of Muir Woods, and the magnifi cent Pacific Ocean vista from Mount Tamalpais) is so impressive, and the neighborhood charms are superabundant. 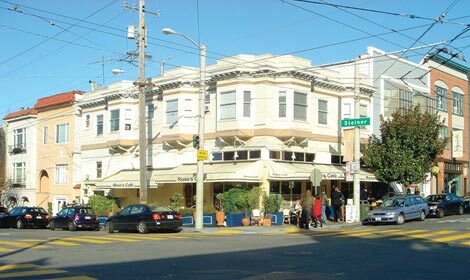 Some of my favorite local streets, pastimes, and haunts in this walkable city include Columbus Street, running through North Beach (the Italian section); Fillmore Street in Pacific Heights (try Tadich’s Grill for dinner or drinks); Union Street in the Marina district with its small shops (stop off at Rose’s Café for lunch, pictured); Haight Street for its offbeat 1960s vibe; Castro Street, which crosses the gay part of town; Stockton Street, passing through Chinatown; Union Square; and the Golden Gate Promenade with its view of the iconic suspension bridge. I also enjoy driving around to take in the incredible views from the neighborhoods of Nob Hill, Telegraph Hill and Coit Tower (it’s worth the hike), Russian Hill, and Pacific Heights. The weather is unpredictable, and it can vary depending on which part of town you’re in. Mark Twain’s famous words, “The coldest winter I ever spent was a summer in San Francisco,” may be an overstatement, but it’s true that the warmest and sunniest months are September and October. During the summer months, fog rolls in and blankets the city. The areas farther west, near the ocean, tend to get more fog than downtown. Wear layers, since a warm morning can turn into a chilly afternoon. As for winter, the worst part is the rain—though it’s never very cold, and there can be weeks of sunny, crystal blue skies. While there you will want to spend most of your time at the terrific cultural establishments, including the de Young Museum (50 Hagiwara Tea Garden) and the recently renovated “green” museum—the California Academy of Sciences in Golden Gate Park (55 Music Concourse Dr.). I also enjoy touring the esplanade and viewing the public art at Yerba Buena Gardens (4th and Mission streets) and the San Francisco Museum of Modern Art (151 3rd St., between Mission and Howard streets). Be sure to spend at least a day heading north to wine country in Napa or Sonoma counties. In Napa, two of my favorite wineries for a tasting are The Hess Collection and Domaine Chandon. On another day, take a leisurely drive over the Golden Gate Bridge, and visit the lovely towns of Marin County, including Mill Valley, Sausalito, and Tiburon. Stop by Stinson Beach on a sunny day—it’s not far from Muir Woods. Back in the city, nightlife revolves around fine dining, since the city has a rich culinary tradition. In fact, it’s hard to find a bad meal. Unlike in some other cities where you pay top dollar for mediocre dishes, you are very likely to have great food at decent prices here. A few of my favorites include A16 (2355 Chestnut St.; entrées from $22) for solid Italian fare in the Marina district; for seafood in a sophisticated, contemporary setting downtown, try Aqua (252 California St.; prix fixe menu from $75); Zuni Café (1658 Market St.; entrées from $14) serves nice meals in Hayes Valley; and for a special occasion, head to the Westin St. Francis hotel for the finest steaks at Michael Mina (335 Powell St.; prix fixe menu from $100). For a typical San Francisco brunch, try the dim sum at Yank Sing (49 Stevenson St.; prices à la carte). For something more traditional, you can’t beat the Garden Court (2 New Montgomery St.; entrées from $22), the glass-domed former carriage entrance to the historic Palace Hotel, built in 1876. If you want a hotel with a view, a smart splurge is the restored Fairmont (from $299/night) in Nob Hill. The Ritz (from $429/night), also in Nob Hill, is an excellent choice and has a more intimate ambience. Campton Place (from $250/night), steps away from Union Square shopping, is one of my favorite boutique hotels. Be sure to ask for a high-floor, corner room with a view. For a hip and trendy scene, try the Clift Hotel (from $295/night; clifthotel.com), and for an overall good value, you can’t beat the Villa Florence (from $133/night), also near Union Square. San Francisco has an urban charm and sophistication, and a special community feeling like no other place. Residents feel a sense of privilege living here, and rightly so.